The Tiago is Tata’s latest entry into the compact car segment. The new phase of Tata Motors began with the launch of the Zest where the Indian manufacturer has attempted to revamp the Tata image as a more modern and vibrant car maker.The Tata Tiago is available in five trims – the XB, XE, XM, XT and the XZ. While the XE, XM, XT have been around in the Zest and the Bolt, the XB (base) and the XZ (top-spec) variants are new. 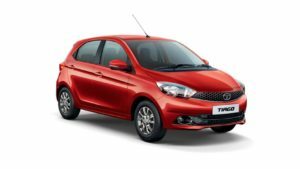 You can also opt for the safety package for as much as just Rs 18,000 over the XE, XM and XT trims.The Tiago offers a well-engineered, modern day package to the Indian buyers in the compact car segment. Where the Tiago claws back points is in ride and handling. There is an underlying firmness to the ride and vertical movements are sharper than what you’d get on the Bolt but the Tiago’s175/65 R14 tyres still round off the potholes very well and also nice is the way the Tiago handles corners thanks to the excellent grip offered by the Goodyear tyres.Straight line stability is big car good too and it’s hard to unsettle the Tiago. The steering feel has a nice amount of heft which is reassuring, especially at highway speeds but unlike in the Bolt or Zest, it’s devoid of feel and feels vague around the straight ahead position.It must be noted that the suspension set-up is better on the petrol Tiago. The diesel Tiago which an engine that weighs 20kg more uses stiffer front springs and dampers, which affects the ride. It’s not as pliant as the petrol, feels more nose heavy and you can feel a bit of road shock filtering through the steering column. The Tiago gets an energy-absorbing body structure that will bear the brunt of a crash without transferring much of it to the cabin. It also gets dual front airbags along with ABS and EBD. While the airbags can be opted for in every variant barring the base, ABS remains exclusive to the top-spec Tiago. Tata is asking for Rs 35,000 more for this AMT variant over the standard model and that is not bad at all. The Tiago checks all the right boxes. It offers the right styling, good space and appreciable performance. Combine all this with an AMT gearbox and life in a metro will be practical and stress free. The gearbox still has some niggles, like the jerkiness at low speeds and uphill crawling, but rest of the aspects are appreciable. Buy this car if you really want a small smart-looking automatic hatchback. The other option that can be considered here is the Maruti Suzuki Celerio AMT, which is Rs 35,000 cheaper than the Tiago AMT.